Great Aunt Zelda grew Zinnias in a huge circle around her palatial house in East Swindon. She grew mixed colours and told me the aliens would speak to her through the blooms in late summer. You see Zelda was a world famous medium…she was on Parkinson in the 70’s…he was surprised when she told him her spirit guide was a fairground donkey called Martin. What Actually Are Zinnias Mr Higgledy Man? Well my floralesque friends…Zinnias are actually part of the Aster family…and very closely related to the Daisy family (which is nice…). These blowsy blooms are infact native to Mexico and were first introduced to Europe by those marauding and adventurous Spaniard fellows. Single Flowered – Blossoms have one row of petals and the centre of each flower is exposed. Semi-Double Flowered – Blossoms have several to many rows of petals, but the centre is exposed and fully visible. Fully Double Flowered – Blossoms have many rows of petals and the centre of the flower is hidden by the petals. Cactus Flowered – Blossoms have long petals. The edges of the petals roll under and the entire petal twists to create a unique flower form. 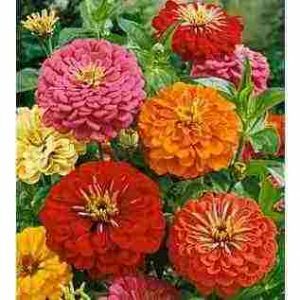 How Does One Go About Growing Such Beautiful Zinnias Snr. Higgledyshanchex? First of all you will be delighted to know that growing Zinnias is a piece of cake. *Either direct sow in the soil where they are to grow AFTER the frosts have gone…which is mid May for us in East Anglia. Or sow in modules a few weeks before but remember, Zinnias despise root disturbance, so don’t let them get too big before planting out. So I would suggest not sowing before mid April. *They MUST have full sun. No sun – no party. *Put them in the earth on their edges and bury them approximately twice their width deep. *Plant or thin the seedlings out to 8 inches apart. *Water regularly but don’t allow the soil to become waterlogged. *If your plot is exposed I would recommend some support. I use pea netting stretched horizontally across the bed. *I shall be sowing right up until the end of June. 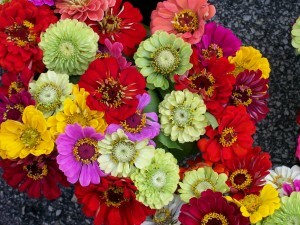 How Long Do Zinnias Last In The Vase? *Yonks…about ten days. Some folk suggest they are too old fashioned as a cut flower. I agree they don’t have the relaxed English country feel about them…but they bring something else to the party…bright…raucous…noisy…think Mexican Mariachi band. They’re fun and reliable…try them. This year I am stocking Zinnia ‘Mammoth‘ and Zinnia ‘Dahlia Flower‘ both of these are scorchio gorgeous and have strong stems which help make them fab flowers for cutting. We of course will be growing both of these this season and will let you know how we get on. Flowers To Sow In May	Is it too late to sow Flower Seeds? which is the variety in the second picture Ben? is it the mammoth? I like the look of them. My “Seeds to Sow In May” arrived today. WOOP!! Thanking you most hugely for the extra Ricinus seeds! Busy times ahead Vince, busy times!!! Can’t wait to be chucking overflowing vases of the most gorgeous blooms all over the house! Oh you are a walk over Lisa! ;) You won’t regret it however.